San Antonio, TX – As a private, nonprofit university, with more than 150,000 alumni around the country, National University is committed to supporting projects and programs that serve the public good. The University’s recent collaboration with San Diego Zoo Global and philanthropist T. Denny Sanford to bring San Diego Zoo Kids Channel to University Children’s Health in San Antonio, TX is a demonstration of that commitment." 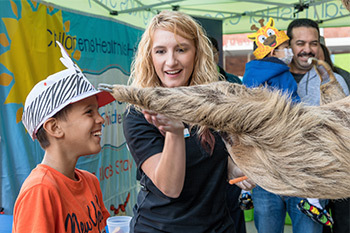 The San Diego Zoo Kids Channel is a closed-circuit television network exclusively for medical facilities that serve pediatric patients and families. 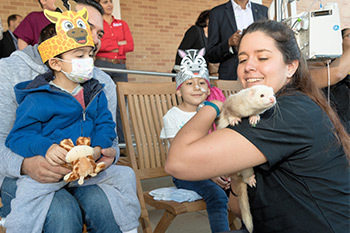 The programming offers animal-oriented stories that are both entertaining and educational for kids and their families to watch during hospital stays. Dr. Michael R. Cunningham, chancellor of the National University System and Dr. David W. Andrews, president of National University visited the families at University Children’s Health to announce the University’s sponsorship of the new initiative. "We are so excited about this partnership with San Diego Zoo Global and Mr. Sanford to provide San Diego Zoo Kids to the patients and their families at University Hospital in San Antonio," said Chancellor Cunningham. "At National University, we are committed to serving our Texas community, and we are pleased to be a part of this wonderful program." National University, which has the tenth largest school of education in the country, is a leader in supporting and empowering teachers nationwide. In addition to sponsoring the educational zoo TV programming, the University announced it will provide four full scholarships for San Antonio teachers to attend San Diego Zoo’s Teacher Workshops in the Conservation Science Program this summer. Mark Webb, CEO of University Children’s Health, Debra Erickson of the San Diego Zoo and Denny Sanford were also present at the San Antonio launch of the San Diego Zoo Kids channel. Along with Mr. Sanford’s philanthropic work with pediatric facilities bringing hope and health to many families, he’s also the visionary behind the Sanford Harmony program at National University. In addition to National University providing educational opportunities for thousands of Texans in programs such as nursing, cybersecurity and business, the National University-based Sanford Harmony program, a research-based, social emotional learning program, is also expanding into the Texas communities. Since its nationwide launch two years ago, more than 16,970 classrooms are currently in various stages of implementing Sanford Harmony, which represents more than 366,000 children in cities throughout the country from Los Angeles to New York City. Concurrent with National University’s dedication to providing educational opportunities and giving back to the community, the University is pleased to serve as the presenting sponsor of the San Diego Zoo’s new spring event, Yaycation. This event will take place during five weekends from March 25 – April 23 and will involve a variety of fun and engaging activities, including meet-and-greets with animals from around the world, talks with animal care staff, educational activities for kids, live entertainment for the whole family and more. The University is proud to give back to the communities it serves through partnerships and providing programs that allow it to support healthy and strong communities. 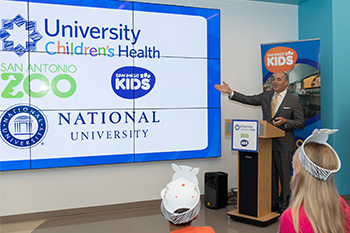 University Children’s Health is the pediatric treatment and innovation arm of University Health System, a nationally recognized teaching hospital and comprehensive network of outpatient healthcare centers owned by the people of Bexar County, and ranked best in the San Antonio region by U.S. News & World Report. University Health System is committed to delivering patient-centered, culturally competent and high-quality healthcare for adults and children built on a strong foundation of outcomes-based research and innovative teaching. Learn more at UniversityChildrensHealth.com. Bringing species back from the brink of extinction is the goal of San Diego Zoo Global. As a leader in conservation, the work of San Diego Zoo Global includes on-site wildlife conservation efforts (representing both plants and animals) at the San Diego Zoo, San Diego Zoo Safari Park and San Diego Zoo Institute for Conservation Research, as well as international field programs on six continents. The work of these entities is made accessible to children through the San Diego Zoo Kids network, reaching out through the internet and in children’s hospitals nationwide. The work of San Diego Zoo Global is made possible by the San Diego Zoo Global Wildlife Conservancy and is supported in part by the Foundation of San Diego Zoo Global. The San Antonio Zoo® is a non-profit organization dedicated to providing outstanding animal care while consistently offering an exceptional recreational and educational experience to more than one million guests, annually. The zoo is open daily, and operating hours and admission prices vary. Accredited by both the Association of Zoos and Aquariums and the Zoological Association of America.